Whether it’s from their interns or employees, it’s a sure-fire way to boost morale and get stuff done! But how to achieve it? This week we’ve been thinking about The Simplifiers culture of appreciation and how this has led to us being a motivated and productive team. Keep reading to hear why showing appreciation is crucial to your firm and get our top tips on how to do it. This has been so important for us recently because of the intense time The Simplifiers have had with our (successful!) Kickstarter campaign. During our month of crowd funding, we all put in the extra effort needed to make sure we reached out target. So, where did all this motivation, loyalty and desire to go the extra mile come from? Confession Part 1: On some projects in the past, once my motivation has declined, I’ve just done my contracted hours, completed work to a satisfactory level and switched off the moment I stepped out of the office. So why is the culture of appreciation at firms like The Simplifiers so effective? I like knowing that I’ve made a difference, I like feeling valued and I like recognition. These are some of my key motivators and studies show that this is the case for the majority of workers no matter how junior or senior. One study showed that 81% employees said they’re motivated to work harder when their boss shows appreciation for their work. Employees are likely to be more productive and produce higher quality work because they are want to make contributions which have a meaningful impact on the firm and generate success. Everybody wins! 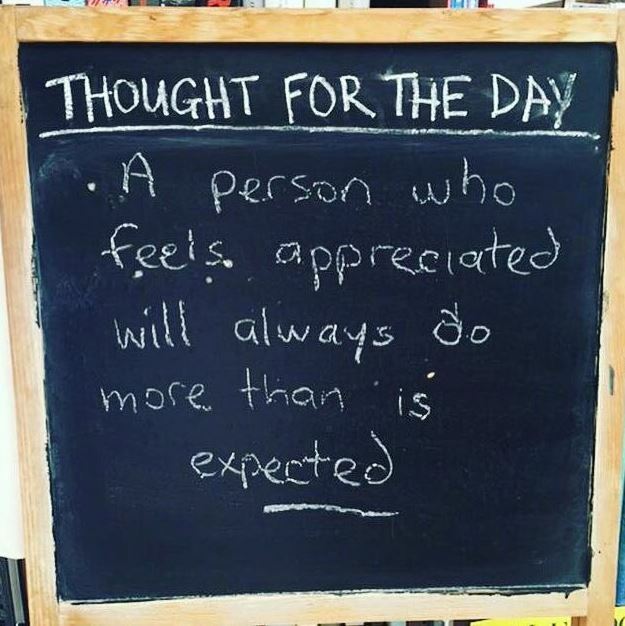 So far it seems obvious that we should all be showing appreciation for our employees and our colleagues, but why do some firms fail to do this? Confession Part 2: I’ve been guilty of not showing appreciation to my unpaid volunteers in the past. Sometimes when you’re under pressure it can be frustrating to feel like you’re reassuring people constantly and telling them that they’re doing a good job. In some cases you even feel like it would be easier and faster to do the work without them! But I noticed that when I took the time to notice and show my appreciation, productivity increased and the standard of the volunteers work improved. Turns out just noticing and appreciating the effort they were putting in and letting them know that the work they were doing was making a valuable contribution made them more engaged, enthusiastic and committed. So how can you make your employees and interns feel appreciated? Just say thank you! Try to be specific about the work you are praising and show appreciation to individuals, not just teams. Give individuals a shout out. This could be in a meeting or even over social media. Show your employees some love on twitter or Instagram. Giving a shout out shows you’re proud and value your team members enough to tell the world! Added benefit: It gives your social media presence a positive, human touch and might help you with future recruitment. Make employees part of the decision making process. Ask them for their opinions – you never know when they might come up with a killer idea! Unexpected treats. Chocolate never fails. Be genuine. I once worked with a manager who praised the team excessively for the most basic of successes. We felt like we were kids and as though we didn’t need to put in any effort to please. Get the balance right. Invite employees and interns to join you at networking events or important meetings and give them the opportunity to develop their skills and experiences. Lastly, invest in your interns! Give them the skills and knowledge they need to be valuable team members in your firm. Pre-order The Apprentice Program today to get 6 weeks of custom-crafted for just $75/intern… all packaged together on our brand-new platform, thanks to our Kickstarter backers!